Look it up, bookmark it, download it. The best that our internet trolling has turned up. The ultimate reference package is in this link. This is an incredible collection of free sailing & maritime related documents. Includes the atlas of pilot charts, sailing routes & planning guides, Bowditch's classic - American Practical Navigator, International Code of Signals, Chart No. 1, Radar Navigation, Ports of the World, Mariner's Weather Handbook. A veritable library of maritime essentials. And all in one link. I love the internet! Need high quality performance oriented gear to make running & standing rigging more functional? Put your credit card away in a safe place before you go to this site. Tylaska. Everyone is putting out summer reading lists, so here is mine. I love to read, mostly maritime non fiction. It's a small & wonderful niche. Here are my top 13. Not in order of priority but my absolute favorites are clumped up near the top. One of our most critical calculations when we plan an ocean passage is fuel consumption. We find out optimum running speeds and in the final bit of decision making, we decide how much fuel to carry. At 7.5 lbs per US gallon (or 874 grams per liter), its one of the heaviest items on board and since weight has a significant impacton performance, we like to be as precise as possible without being foolishly stingy. Our best record on a transatlantic crossing was 8 liters of fuel consumed. Here’s how we calculate fuel consumption on auxiliary motors. 1.Go online to the manufacturer’s website for the engine that is on the boat. Here’s an example using the 40hp Volvo D2-40. download the PDF product bulletin and you will see this. This will give a fair indication of how much fuel your engine will use. All engines are slightly different and there will be small variances. 3.We use only one engine at a time when making passage as you get about 80% drive from one engine and only about 20% more speed, if you use both but you will double the fuel consumption. We alternate them daily to keep engine hours matched. 4.Clean props and hull make a huge difference to consumption. 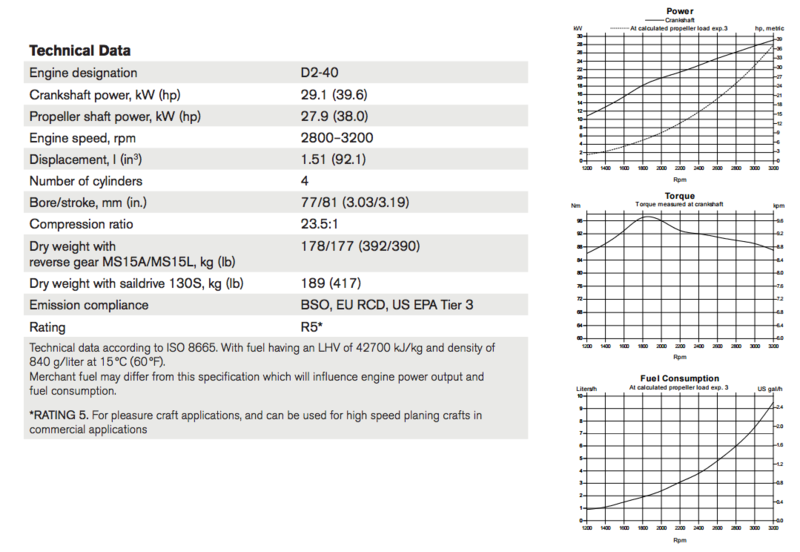 5.Prop selection also is important factor..
6.Motor sailing gives slightly more speed and range. Especially if you canmotorsail your way into more wind. 7.When you know your consumption you can work out your range.